One of only 50 ever built, this is possibly the finest T350T on sale today. With only 30600 miles on the clock, I have been its second custodian for the past 130000 miles. A 54 plate model, it comes with all the updates introduced on the later cars but, uniquely, retains the stunning carbon fibre roof panels that TVR had considered too expensive by this point. Since owning the car, I have further developed it (at eye-watering) expense into one of the finest examples on the road today. There’s no doubt that black cars are fastest - you only need to see the way the rear lights visually disappear into the bodywork to know that! To add to the aggressive curves, the rear has been professionally modified to carry the outrageous Sagaris rear spoiler with its industrial bracketing in all the right locations. HID headlamps (the one’s that work for forum readers) and LED bulbs throughout mean there’s no missing the car. Remote boot release has been added for convenience. The car was extensively re-sprayed last year and the nose is completely free from stone chips. Partial Armourfend protection film protects against further damage. There are one or two marks and scrapes on the drivers door which would be easy to sort out. SP12 alloy wheels massively reduce the unsprung weight over the originals and are considerably stronger. I have just had them all refinished in stunning BMW silver. Tyres are Michelin Pilot all round with less than 500 miles on them. Stainless steel wheel and locking wheel bolts should always have been standard! The brakes are have been upgraded to the larger Sagaris discs front and (uniquely) rear. No significant pad or disc wear to be seen (replaced 8k ago). Callipers have been painted crackle red with yellow accent. I’ve always been very particular about the way the car handles. Nitron shocks and Eibach springs were installed, along with an initial setup. Convinced that things could be better still, I took the car to Centre of Gravity - the finest in the land. Along with identifying a problem with the steering rack (subsequently replaced), they thoroughly tested the dampers and tweaked the setup. I challenge you to find a better handling T350. Oh my. Not one for vegetarians! I can’t contemplate what this has cost me to achieve but it really is the ultimate TVR interior. The seats were designed by Sparco for the Sagaris 2 at the request of The Russian. Insanely expensive, 50 sets were made before the whole project hit the skids. They are simply the most supportive and comfortable seats I have ever sat in - try finding another TVR owner who uses their car to CURE their backache! Combined with the carbon fibre pedal surround with added clutch rest and stunning Momo wheel, the car is simply a delight to pilot. The majority of the interior was re-trimmed last year in Blackpool by Trim Unique (one of TVRs original and finest upholsterers) in sumptuous leather and genuine Alcantara. Outrageous curves meet fluted door trims while you are surrounded by the best smell this side of a Rolls Royce. The satnav is Pioneer’s very latest model with Bluetooth and iPod connectivity and while the car was being re-trimmed, I upgraded the speakers to 13cm drivers in the doors and a 15cm pair in the rear. A courtesy lamp in the boot was frankly very little use so I’ve added individual map lights to the head lining. Air conditioning is a must really on these cars and after a recent service with PSE, I’ve moved the heater amplifier into the cool air flow so it should never cause problems again. The glorious 6 cylinder 3.6 was first re-built by TVR at 5k miles. It was subsequently re-built again by TVR Power at 20k, at which point a new clutch was fitted. TVR Power have subsequently taken the head off and no concerns were raised. It has been modified with TVR Power’s throttle body gaskets to improve the low speed response and while the cam cover was being powdercoated, I installed Racing Green’s gasket to remove any risk of the timing chain slapping the cover. And yes, those are light alloy cam cover bolts and a carbon fibre plug cover. A 3.73 final drive differential means that rearrangement of your internal organs is only a prod of your big toe away. 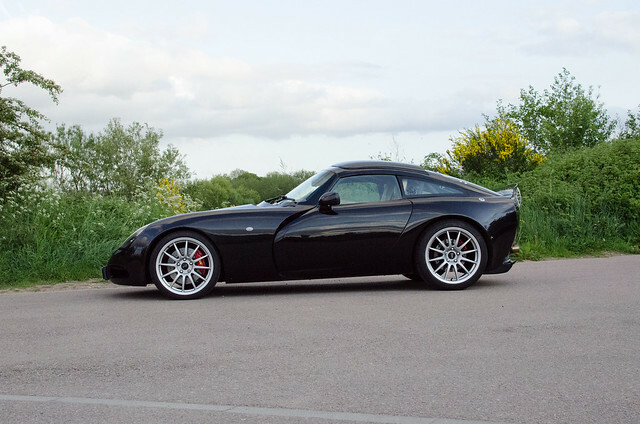 TVR Power’s sports exhaust means it sounds exactly as a TVR should. I will include the standard exhaust in the sale in case you want to do track days (It’s never been tracked to this point). The engine has always warmed up correctly, has been shown the utmost mechanical sympathy and is fitted with a Wolverine Oil Heater to ensure longevity. The car comes with a full TVR service history and a file full of receipts documenting its past. I will also include the Graham Varley Bible (£500 at last Ebay auction!) in the sale, along with an armful of parts. The car is HPI-clear and, with only two owners, there is very little I can’t tell you about it.